Digestive Advantage Gas Defense Formula is your solution to maintaining digestive health by restoring the natural balance of good bacteria in your intestines, while helping to lessen minor abdominal discomfort, bloating, and gas*. 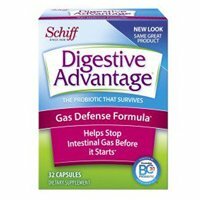 The unique patented daily probiotic in Digestive Advantage Gas Defense formula, BC30, is protected by a protein shell which allows it to survive through the harsh conditions of your stomach to reach the intestines where you need it most to promote long term digestive and immune health*. It's the probiotic supplement that survives stomach acid 100x better than yogurt and leading probiotics**. The enzymes in the formula help in the breakdown of hard-to-digest carbohydrates and help stop gas before it starts to promote long term digestive and immune health*. *These statements have not been evaluated by the Food and Drug Administration. This product is not intended to diagnose, treat, cure or prevent any disease. **Based on median % survivability of Digestive Advantage probiotic vs. leading probiotic supplements and 19 probiotic yogurts in simulated gastric PH for 2 hours. Survivability and delivery of probiotic cells to the small and large intestines is one of the several factors influencing overall product effect. No artificial flavors. Guaranteed for purity, freshness and labeled potency.